The demand for light weapons is swiftly increasing among different end-users across the globe. The market is driven by several factors, such as increasing terrorist incidents, rising instability in Middle-East and Africa, and military modernization programs, among others.The light weapons market accounted for a market value of $10.21 billion in 2016, with military end-user holding the highest share. The Global light weapons market has exhibited a moderate growth in the recent past. Usage of light weapons in armed forces has increased over the years with advancements in technology. The increasing land disputes across the borders, rise in conflicts, and terrorism activities and rising defense spending are the factors for the growth of global light weapons market. Furthermore, low cost, lethality, portability, and simplicity of weapons have increased their adoption in armed forces as well as civilians. The demand for light weapons has experienced a significant rise in the recent years, and the trend is anticipated to continue in the future, owing to the changing nature of warfare and growing conflicts across the globe. The rise in demand of light weapons across emerging nations and military modernization programs are expected to open several new opportunities for light weapons market in the years to come. This report identifies the global light weapons market in different segments, such as type, end-user, and region. A detailed competitive analysis has been included in this report which focuses on the key market developments & strategies followed by the major players in the market. The light weapons market is also analyzed into different types such as anti-tank guided weapons (ATGW), anti-aircraft missile, rocket launchers, man-portable air defense systems (MANPADS), heavy machine guns, light cannons, recoilless rifles, grenade launchers, mortars, grenades, and rocket propelled grenades. In this report, various end-users of the light weapons market have also been studied. The end-users include military and homeland security. 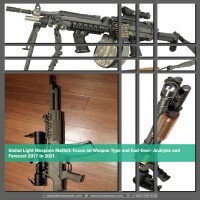 The light weapons market has been analyzed for all the regions including North America, Europe, Asia-Pacific, and Rest of the World with further analysis with respect to several major countries. The key market players are analyzed and profiled in detail in the Company Profiles section of the report. This section covers the business financials, company snapshots, key products & services, major developments, and finally, the individual SWOT analysis. 9.10 Rafael Advanced Defense Systems Ltd. Figure 9.45 SWOT Analysis – Raytheon Inc.
Cold-war period led to the major developments in the weapons technology due to rising tensions of large-scale conflict between USSR and the U.S. The period witnessed a huge proliferation in all types of weapons ranging from nuclear to light ones. The advancements in technology has also led to the development of portable weapons. The portable weapons are generally small arms and light weapons which are easy to operate, cost-effective, and durable. Since, 13th century small arms have undergone a massive transformation in design and operation. Nations have continued to use their military as an instrument of force to attain their national objective, whether it is local or beyond borders. Light weapon is a broad term that refers to any weapon that can be carried by two or three people serving as a crew. Light weapons are increasingly being adopted across military and homeland security end-users. Some of the prime factors behind the rise in the demand of light weapons are changing nature of warfare, increasing land disputes across the borders, and rise in defense spending. The demand for light weapons is swiftly increasing among different end-users across the globe. The market is driven by several factors, such as increasing terrorist incidents, rising instability in Middle-East and Africa, and military modernization programs, among others. The light weapons market accounted for a market value of $10.21 billion in 2016, with military end-user holding the highest share. The Anti-Tank Guided Weapons (ATGWs) market accounts for a large share in overall revenue generated. The high share of ATGW is mainly attributed to the growing need for the guided weapons across defense agencies. During the forecast period, the grenade launchers market is expected to grow at a faster rate in comparison with other types. North America is expected to dominate the market during the forecast period (2017-2021) which is followed by Asia Pacific, Europe, and Rest of the world. The United States is the leading country in the light weapons market, globally, and is expected to maintain its dominance during the forecast period. Asia Pacific is expected to grow at the highest CAGR with China dominating the market in this region. This region is growing at a much faster rate as compared to North America and Europe due to continuous efforts by both the government and light weapons manufacturers. Some of the key players in the light weapons market include: Lockheed Martin, Orbital ATK, Raytheon, General Dynamics, BAE Systems, FN Herstal, Heckler and Koch, Thales Group, Saab AB, Rafael Advanced Defense Systems, Elbit Systems, among others.